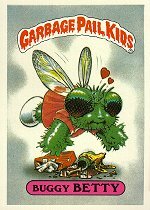 There were two unique printings of the United States Garbage Pail Kids Giant 1st Series. One of the printings had card 8 Adam Bomb with "Most Unlikely To Succeed Award" printed on the back of the card, and the other printing had card 8 Adam Bomb printed with "Most Unpopular Student Award" printed on the back of the card. 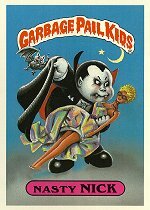 The United States Garbage Pail Kids Giant 1st Series was based on the "a" cards from the United States Garbage Pail Kids 1st Series. But for the Giant 1st Series, the 1st Series cards 9a Boozin' Bruce and 17a Wacky Jackie were replaced with 40a Unstitched Mitch and 41a Mean Gene. The two replacements reduced the total number of cards in a numerical set of the Giant 1st Series to 39.